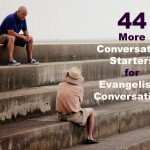 Tactful spiritual conversation starter questions can open the doors to significant evangelistic conversations. Tactful means that you sensitive to the timing, the prompting of the Holy Spirit, and the level of your friend’s spiritual thirst. Tactful means paying attention to your own motives as you ask the questions: are you forcing a conversation or manipulating the situation?